Auscript’s parent company Record Holdings was awarded a Special Mention at the Brisbane Lord Mayor’s Business Awards overnight, for the Company’s digital strategy. Record Holdings subsidiaries, Auscript and For The Record, received the Special Mention for completely re-engineering the traditional court recording and transcription process, introducing world-first digital technology and eliminating the need for slow analogue systems. 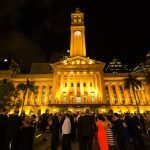 Record Holdings CEO Peter Wyatt said it was an honour for the Company to be recognised for its contribution to the local economy and for putting Brisbane-made court recording technology on the world stage. “It’s an acknowledgement of our very deserving, hardworking and passionate teams of people who are behind the scenes creating digital court recording innovations the world has never seen before,” he said. Mr Wyatt was also a finalist in the Business Person of the Year category of the Lord Mayor’s Business Awards, which was won by Domino’s Pizza boss Don Meij. For more information visit www.lmba.com.au.